Is it just me, or does my head look very blocky? Congrats to Jason and C.K. for launching Mahalo, the first humann powered search engine. This weekend was the wedding of my dear friend Owen to his lovely bride Jess. Check out all the pictures I took here. I've known Owen for about 12 years now (has it really been that long?) and while I am pretty sucky about keeping in touch with people Owen has made the effort to say in touch with me (why, we might never know). Now that Thad is in Philly I make it out to Allentown more often for some quality Owen time, which is a good thing indeed. Anyway, I hope you enjoy the pictures as much as I enjoyed the wedding. Jess and Owen, here's to many years of bliss. And it is of me! Shocking, no? I have about 280 pictures to upload, but every time I look at this picture I laugh, so it gets to be first! In case you can't tell I was making love to the camera. I've subscribed, and I suggest you go the same. An old shirt, a new fit! Elisa bought me this shirt many years ago (at least 5 I would guess), and I didn't tell her that it didn't fit me when she bought it for me (I mean, it was a 3XL. It totally SHOULD have fit at the time, but it would seem the company that makes this shirt makes small 3XLs). I held onto the shirt though, even though I gained lots of weight and it looked like I would never be able to actually wear the shirt. Thanks to Scott Gets Fit (and shedding lots of weight) I am able to finally sport this shirt. Sweet, huh? Look what I found in my mailbox today! 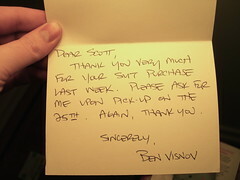 That's right, a handwritten note from Ben, the very helpful salesman who sold me my suit at Boyds. That's something you don't get at Men's Warehouse, and it is a very nice touch. I like to think of myself as shy and retiring, an opinion that isn't always upheld by reality. Sure, I'm fairly shy around people I don't know, but around friends I'm far from shy (and if I'm in front of a crowd... forget about it). Concurrently, I like to think of myself as someone who is happier behind the scenes, not the center of attention. Once again, reality disagrees. There are many pictures of myself on Flickr (234 at the moment), which I suppose isn't the mark of some shy, reticent individual. I was amongst those lucky enough to be invited to a certain someone's birthday party, so I got gussied up (you never know who you'll meet at these parties. Yes, ladies, I am single.) and headed on over. Stellargirl was also in attendance with her camera in hand, and for some reason, and with no prodding from yours truly, she decided to start snapping pictures of me. Once it became clear that our height differences were making the ideal shot difficult to get she had me sit in a chair, which I did because I am ever the willing photographic subject (see here, here, here, and here). 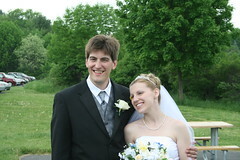 As the camera clicked away Becky walked in, and rolled her eyes saying, 'Of course, Scott is getting his picture taken.' Really, what party is complete without me getting my picture taken at it? Anywho, the real reason I am writing this post is to call your attention to the face that I am making in the above picture (taken by stellargirl herself). 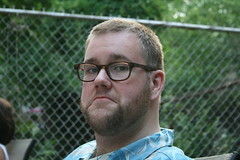 This face is my default picture face (Lord knows why) and as such deserves a name (ala Zoolander's Blue Steel). Sound off in the comments with some suggestions! You know you want to. I need to download some of these. I ate like crazy! Ice cream, cake, muffins... you name it I ate it. Therefore, I take this tiny gain as an indication that I am on the right track! Hurrah! I was reading through my feeds this morning, as I am wont to do, when I came across this post on That's Fit (Weblogs, Inc's fitness blog). I scanned the headline and I would have sworn it said, 'Students exposed to testicles,' which I thought was kind of odd. I then re-read it and realized I have many, many issues. I have mentioned Boyds on Blankbaby before, but goodness it sure is a nice place to buy clothes. Owen’s wedding is coming up (check out some pics of his bachelor party weekend on Flickr, and no there aren’t any strippers) and since I am supposed to be an usher (I ush with the best of ‘em) I need to look my best. 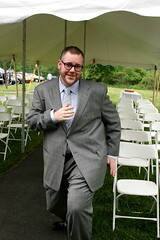 3 years ago (almost to the day) I bought a very nice suit at Boyds which is hanging in my closet at this very moment (see a pic of me in this suit here. I’m pretty hot, huh?) so problem solved, yes? No, thanks to Scott Gets Fit that suit no longer fits me at all (which is great) and that leaves me without a suit. Off to Boyds I went. Why Boyds? It is true that they aren’t cheap, but oh the service! I went up to the 4th floor (that’s where the big and tall shop is) and as I got out of the elevator 2 salesmen asked me what brought me to their fine establishment. I said I was looking for a suit and Ben asked me to follow him. Off we went to a rack of suits from which Ben selected a suit to get a feel for my size. Guess what? It fit… like a suit that fits well. I explained to Ben I was going to a wedding and I needed a darkish suit. Like that Ben pulled out a bunch of nice suits for me to pick from. I tried one on and looked at myself in a mirror. Oh, I looked good but then again I always do! Then I glanced at the price tag and I quickly had to figure out a nice way to say, ‘This suit is great but there is no way I’m paying $1500 for it, dude.’ I said I liked the suit, but it wasn’t exactly what I was looking for and luckily I think Ben picked up on the fact that the suit was a little out of my price range. He showed me several more suits which both looked better on me, and were way more affordable. Ben and I narrowed the choices down to two suits, one from Burberry (I have a fondness for Burberry stuff) and the other from Joseph Abboud (whom I have never heard of, but it would seem he is well known). I liked both of them, so Ben suggested we have the tailor dude take a look at me in both and give his opinion about which would be best. The tailor, a tiny man with chalk covered fingers, took a look at me in both and declared the Abboud the winner, a decision which Ben agreed with (and I know they were being honest because the Abboud was the cheaper choice!). Ben suggested that I might want to get both, just in case I had some sort of suit related crisis. I explained to Ben that I wear Hawaiian shirts to work, and one suit would suit me (ha!) just fine. Hey, he had to try. One can’t have a suit and not have a matching shirt and tie to go with it, so off to the shirt/tie counter we went. This might be a good time to mention that I am slightly color blind and a total fashion disaster. I mean, I like shirts that look like this for goodness sake! This all means that I can’t pick out shirt/tie combos to save my life. Ben took my measurements (oh, and here’s something cool: I picked up a few button down shirts from Boyds last year and at the time my neck was a 20. Today? My neck is an 18. Sweet, sweet success.) and then quickly had 3 shirts and several ties for me to look at in a variety of combinations, combinations which I would never have thought of myself which is why Ben makes the big bucks (and works on a commission I would guess, since he suggested that I should get a couple of combos of shirts and ties. I only got one, sorry Ben!). Here’s what is boils down to, what makes shopping at a place like Boyds so much fun: I was there for about 30 minutes or so, and Ben only helped me. He was my suit sherpa, helping me navigate the perilous world of designer suits and accessories. That’s the kind of service that Boyds gives you, and let me tell you something: it is totally worth paying a little extra for personal attention. The suit will be ready next Friday, and I am sure I’ll be posting a ton of pictures of myself in it soon enough. Until then you can get a sneak peek of my new shirt here and here. Just imagine I’m wearing this tie (Double Windsor knot, of course). I know what someone is getting for their wedding present. Matching his and her t-shirts.